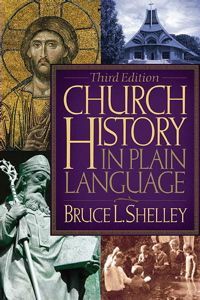 This volume, Church History in Plain English, is the most engaging and readable single-volume history of the Church by bringing the story into the twenty-first century. Faced with some astonishing changes in the Islamic world, a global resurgence of Roman Catholicism, the decline of Christianity in the West coupled with the rapid growth of evangelical and Pentecostal Christianity in the southern and eastern hemispheres, readers need a current explanation with intellectual substance that will provide historical context and update readers on all these new developments. The new edition of Church History in Plain Language does that in a stimulating manner, and it promises to be the new standard for readable Church History. About the Author: Dr. Bruce Shelley is Senior Professor of Church History and Historical Theology at Denver Theological Seminary. He holds the M.Div. degree from Fuller Theological Seminary and Ph.D. from the University of Iowa. Among his previous publications are The Church: God’s People; Evangelicalism in America; and The Cross and the Flame.